Trump’s “patriotic” approach is a recipe for a mediocre future of the U.S. manufacturing sector. There isn’t an easy way to get to manufacturing “heaven” – a productive economy that generates solid jobs. In choosing a cure to the U.S.’s economic problems, president-elect Donald Trump seems determined to apply a well-known Latin American medicine, the strategy of import substitution. He is adamant about pursing an economic policy that gives strong preference to domestic production over buying goods from abroad. Alluringly simple as this sounds, the validity of the concept has been disproven many a times. As emerging market countries, notably Brazil in the 1960s, found out, relying on such an approach usually only drives up costs for consumers and industrial end users, while doing little, if anything to improve a nation’s productivity. Moreover, most of Mr. Trump’s analysis (and hence prescription) appears to be based on competitiveness problems related to low wage costs and “currency manipulation” by China. Those factors, however, are no longer the main factors explaining the competitive gap of China. Now, other more structural factors are at play: Producers in China and other emerging economies actually benefit from building a national infrastructure and logistics that have surpassed many OECD nations, particularly when compared to the U.S. and its decades of underinvestment in the public sector. In addition, China as well as other emerging market nations are beginning to reap the fruit of their investments in education and R&D. Relying on a young and eager population, these countries are creating innovation in several sectors of the global economy that are key for overall competitiveness. China may have joined the ranks of the world’s 25 most-innovative economies in the Global Innovation Index — produced by Cornell University, INSEAD and the World Intellectual Property Organization — only in 2016. However, the pace of its catching up is extraordinary: China ranked only in 43rd place in 2009-10 and 29th in 2015). According to a recent publication of the U.S. Council of Competitiveness (“A Competitiveness Agenda for the 45th President of the United States,” December 2016), China is already second in the world in in scientists per million people. It has also already become number 1 ranking on the 47th edition of the Top 500 list of the world’s top supercomputers, with a new system built entirely using processors designed and made-in-China. To be sure, there are some drawbacks and caution notes that apply to such statistics. However, once this innovation capacity is applied to the manufacturing sector, then literally the sky is the limit for China’s competitiveness. In fact, reading that writing on the wall, policymakers in virtually all major economies were only able to avoid the immediate onset of the destructive consequences of this “manufacturing decadence” by maintaining domestic consumption artificially high. There were also efforts by corporate giants like GE seeking to retrace their own glory by heralding a “manufacturing renaissance” that basically happened in glitzy ads only. The Fed’s policy of money pumping and negative interest rates also helped. Jobs were brought back, but generally only low-paid service jobs — and credit was extended mostly only to the better off, which didn’t help the broader economy. Since structural issues were not addressed, the U.S. economic recovery continues to be a fragile one. Enter Donald Trump. Greatly experienced in taking risky gambles on his corporate and personal balance sheets, he was prepared to call the bluff of eternal soothsaying. He simply said that the “emperor” (i.e., the manufacturing sector) really had no clothes. High tariffs to protect the “nascent industries” and ample public financing for national companies that produced inputs for the new industrial sector. Of all the various policies proposed by Trump, increasing the levels of investments in infrastructure and logistics seems to be a good way to address the competitiveness challenge. However, without significant improvements – and more public investment — in the educational and innovation systems (and just opting for more school “choice” and privatizing public education certainly doesn’t address the core of the problem), infrastructure improvements will not be enough. Of course, Trump can always opt to seek yet more recourse to a “double wall.” He could build a physical one (closing the borders to the south) and a tariff one (threatening the U.S. producers that insist to make the cheap imports in places like China). Both propositions are “full of sound and fury,” but in the real world, if successful at all, would only help bring back low-wages jobs. Yes, more goods would be produced domestically, but – as with China until now – they would have comparatively little value added. Trump’s supposedly “patriotic” approach is thus a recipe for a mediocre future of the U.S. manufacturing sector. It does next to nothing about Trump’s presumed real goal – bringing back well-paying jobs. As Brazilians and other developing countries learned the hard way in decades past, there is no easy way to get to manufacturing “heaven” – a productive economy that generates solid jobs and good incomes. What is needed is a long-term commitment to improving education, innovation, infrastructure and logistics. For all the lip service they like paying to these issues, when it comes to authorizing real money, that is a hard agenda for conservative Republicans in the United States to swallow. Donald Trump now presides over the world’s largest economy. But he better heed the emerging markets’ lesson that shooting for import substitution is (still) futile. If he doesn’t do so, then Trump’s own warnings during the 2016 campaign – that the United States increasingly resembles a developing country – will ring far more true than he could possibly be bargaining for. 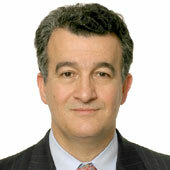 Rogerio Studart is the former executive director of the World Bank Group.